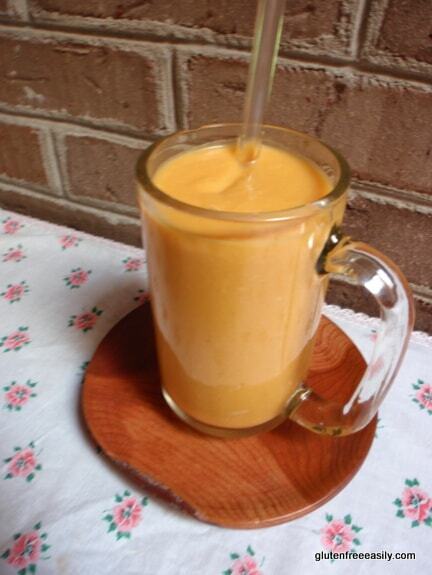 Super Orange Smoothie. That sounds and looks fun, doesn’t it? And delicious. And healthy. You see I’ve been collecting orange things this past week. In my refrigerator. First there was half of a Cara Cara orange. I had purchased the single orange to create a recipe, one I can’t even remember now. Instead, the orange became part of a cocktail to celebrate our first dinner of the season on the screened porch. Oven-Steamed Shrimp with Prosciutto-Wrapped Asparagus. Ah, a simple, but lovely meal on a special evening. Those gorgeous flowers came from gfe reader and friend, Angela Sommers. (You might remember Angela from her trip report on—and safe gluten-free eating tips for—visiting Korea.) She sent these flowers to me as a lovely get well gesture while my eye has been healing. They have been working their magic and the bouquet is even more beautiful now that the lilies have opened. And taking a closer look at this photo, that cocktail looks a lot like this Super Orange Smoothie and while it did contain some of the same ingredients, they were not all the same. But I digress … back to that orange. The second half of the orange went in this Super Orange Smoothie. Then there was the extra sweet potato that I had baked, so I’d be ready when the craving for Sweet Potato Chocolate Chip Mug Pudding hit. That craving never hit because I’ve been busy making other treats of late. For example, I made the original version of my Crustless Coconut Pie and a dairy-free version (subbing slightly less coconut oil for the butter and using full-fat coconut milk) of that pie back to back. The first was for a friend’s luncheon for another dear friend who was visiting from out of state and the second—the dairy-free version—was for our support group meeting the next day. Last, there was pumpkin puree. I opened a can of pumpkin puree because our dear dog, Sonny, had an upset tummy. We were having to “take a walk” outside every 2 hours and he was feeling poorly. The internet gods told me that two teaspoons of pumpkin puree fed to a dog could help with bathroom woes (of either kind if you know what I mean). And that little bit of pumpkin worked! It made Sonny’s (and our) life fairly normal again. Of course, being a good dog mom, I still took dear Sonny to the vet and he’s now on meds, but remember that little tip to tide you and your pup over if your dog has similar concerns in the future. 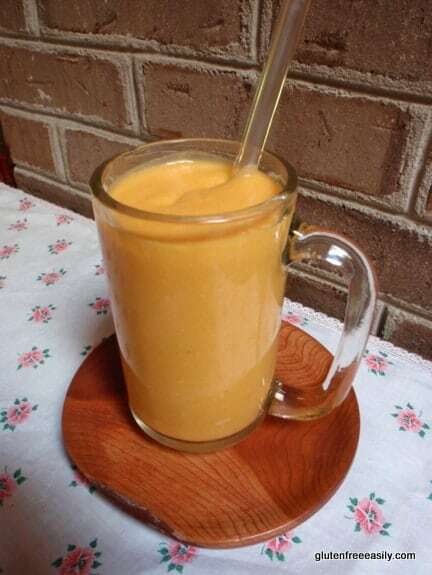 So with all these orange things in the fridge, I decided to combine them all—and a few other ingredients on hand—to create this Super Orange Smoothie. Now you might be wondering why I didn’t include that orange ingredient that is ubiquitous in most households … orange juice. Yes, we always have OJ on hand, but I had some pineapple juice chilled from that cocktail a few days earlier, so I decided to use that instead. Pineapple juice adds a bit more natural sweetness, too, in my opinion. Plus, I wanted to include a wee bit of shredded coconut to this smoothie for a tropical flair and had, in fact, already added coconut milk, and we all know that coconut and pineapple just go together, right? 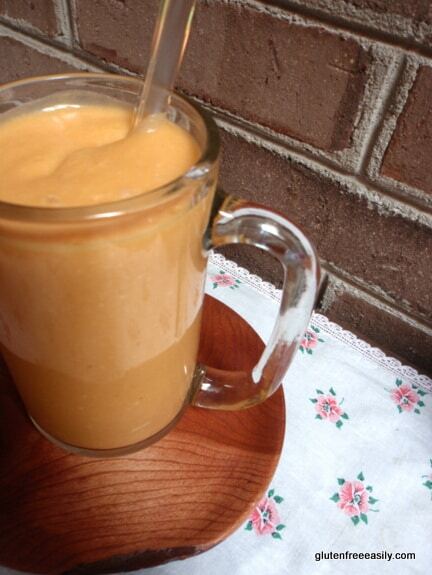 This Super Orange Smoothie fares well on the health index because of the orange ingredients. There’s beta carotene, which is a precursor to Vitamin A, and there’s lots of Vitamin C; read more here on the health bennies of orange fruits and veggies. The rest of the ingredients are pretty healthy as well and ensure a very creamy and yummy smoothie! Oh, and how do you like my eco-friendly glass straw? It comes with its own brush for cleaning. Cool, huh? Mine was provided as part of a complimentary review package from Foods Alive a while back. While the glass in these straws is thick and the straws are considered “extremely durable,” they might not be the best idea for small kids (or super clumsy adults). I like glass straws better than metal straws because you can see if they’re really clean. Incidentally, that is also why I love my Lifefactory Water Bottle! (Mine is the midnight blue one shown via the link, but Lifefactory offers an array of beautiful colors.) I actually won mine from Lifefactory in a giveaway over at Sure Foods Living. I had admired their water bottles for a while before I entered the giveaway, so I was thrilled when I won! I have used mine to drink smoothies, so it’s great to know that I can see if it’s really clean. Enough chatter though … go make and enjoy your Super Orange Smoothie (or your own Super Smoothie with any suitable ingredients you have on hand)! Add all to a high speed blender like a Vitamix. Slowly increase speed to close to highest speed. Blend a minute or so until smooth. Serve and enjoy! I never would have thought of adding almond flour as a protein instead of protein powder. I will have to try that sometime. My caprotein (goat milk protein) gets very expensive if I always add it to my smoothies. And I am so happy you are feeling better and the flowers helped the process. By the way, you have such a lovely porch, and the view is priceless!!! It is a relief to feel almost back to normal now! The flowers are finally fading away, but I’ve re-cut them and changed the water every 2 days and that extended their lives nicely. I love your writing. It feels like you’re an old friend just chatting away, and the glimpses you provide into your thoughts and life are captivating. Thank you for being such a personal blogger friend! The smoothie looks really refreshing, your flowers are gorgeous, and that VIEW outside must be perfect this time of year with all the springtime changes. This whole post made me smile. Brandae–You are such a sweetheart–thanks so much for the super sweet words! 🙂 You are all my friends and it’s easiest to write when I’m just chatting with you. 😉 Thanks, too, for the other feedback. It’s magically beautiful here among the trees now. It happens every Spring of course, seemingly overnight, and we love it! My eye is mostly healed superficially, but my vision will continue to get better as the cornea heals. It will take 3 months to fully heal per the specialist, so I ned to protect it for sure. That is an insane orange infusion Shirley! I was expecting some orange juice and banana, but that’s some serious beta-carotene diversity in there! I think the name is fun and so is the color! Do you think this recipe would work okay if I poured it into popsicle molds and turned it into a popsicle? Thank you for the tip on the pumpkin – good to know. Poor Sonny. 🙁 Glad he is feeling much better now! Wow Shirley – this is an awesome Orange smoothie! What a great combo of sweet and healthy yumminess. I’m glad to hear Sonny is on the mend. The shredded coconut is interesting – does it get blended in and adds creaminess? Shirley, That looks so beautiful and delicious! I love my glass straws, too. They make smoothie drinking so fun. Yes, the glass straws are surprisingly cool, aren’t they? And I love not contributing to our landfill by using a plastic one (although I admit I’ve even washed plastic ones with a brush and re-used them). What a great looking smoothie! Yummy and healthy… I’ll be making this for my kids, thanks! Mmmm… Creamy, orange, rich, and love the additional protein! So sorry that Sonny has been under the weather. Poor dear boy. Hope he’s feeling better. 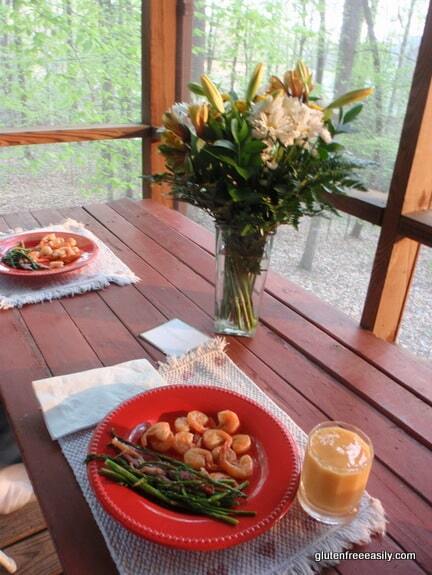 We love dining on our porch and the GFE retreat #2 will be here before we know it! I look forward to your raw creation, Shirley!! Hey Gretchen–Great to see you! 🙂 Thanks so much for the kind words and for sharing with others, too! BTW, thanks for the tip on pumpkin for the doggie troubles. A good friend of mine has an elderly dog with ongoing ‘problems’. Maybe a touch of pumpkin would help Oliver – I will suggeset it.